Catalina Sea Ranch has developed the first offshore aquaculture facility in federally regulated waters of the United States. Its strategic plan anticipates the development of the initial 100-acre site to improve the technologies, validate the economics, and monitor and document any environmental impact. It then intends to expand its aquaculture facility to 1,000 acres and include additional sustainable marine crops. This venture supports the goals of the National Oceanic and Atmospheric Administration (NOAA) Marine Aquaculture Strategic Plan FY 2016-2020 for “At least a 50% increase in responsible U.S. marine aquaculture by the year 2020”. Offshore aquaculture is in the public interest for increasing jobs and reducing America's $14 billion seafood trade deficit. Catalina Sea Ranch launched its aquaculture operations with low-risk, highly profitable mussels suspended on sub-surface ropes in approximately 150 feet deep ocean waters at its 100 acre ranch located six miles offshore California. Mussels are the cash crop, as they are not susceptible to disease and can be harvested from 8 through 12 months after seeding. 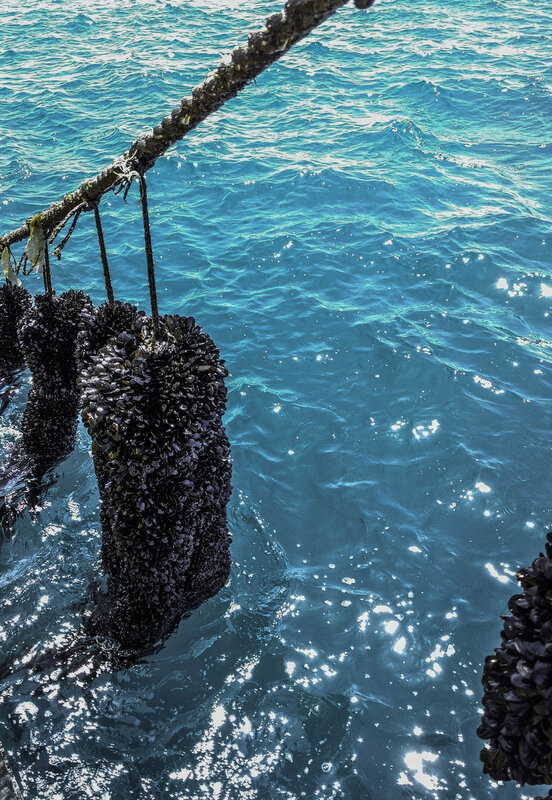 The mussels are grown on continuous loops of suspended ropes submerged 20 feet below the sea surface and supported by floats to provide negative buoyancy for the crops. Upwelling on the massive San Pedro Shelf produces briny, phytoplankton rich waters allowing the mussels to continuously feed in the ceaseless currents. Several months after planting the mussel seed, their increased size, high density, and limited rope space prompts the next phase of the grow-out cycle. The mussels are stripped from their original seed-line, and replanted onto a grow-out line at a lower density. As they continue to grow, the abundance of food and additional space allow them to flourish. Eight to ten months after they were planted, the mussels reach a typical market size of three inches long. They are harvested by equipment on the Enterprise, and placed directly in 5 pound bags that are stored on ice until delivered to shore. Mussels for the masses, direct from the ocean! As the most prolific species of macroalgae in Southern California, Giant kelp fills a unique role in the ocean ecosystem. In ideal conditions, it can grow up to two feet per day, and its sheer size allows it to be an ideal habitat for countless species of fish, crustaceans, mollusks, and other invertebrates. Giant kelp is the backbone and ecosystem engineers for the ocean and vital to the overall health of the southern California coastline. Studies have also shown Giant kelp has enormous potential as a low-impact crop, that can be used to mitigate climate change across several disciplines. The ability to sequester carbon, reduce local ocean acidification, and dramatically mitigate livestock methane emissions when added to feed, is unique and shows remarkable potential as a future environmental crop. Currently, Catalina Sea Ranch is developing a nursery and planting program to evaluate the potential and practicality of Giant kelp as a new sustainable marine crop. There are 500 feet of experimental line growing at the ranch, with juvenile kelp planted onto it which produces a harvestable crop in about four months. This it the first kelp planted in U.S. Federal waters. Like mussels, purple-hinged rock scallops are low-trophic, filter feeding, mollusks. However, they do not possess mobile byssal threads. After settling occurs in the first few months of their life cycle, purple-hinge rock scallops remain sessile. Catalina Sea Ranch is investigating the most effective and efficient methods to cultivate this species, and is also researching selective breeding for producing increased growth rates and larger meat medallions. Pacific oysters are a highly sought after commodity. They possess the same low-trophic, filter feeding capacities as mussels and scallop, with a key difference in their growing cycle. Oysters require additional maintenance, and must be regularly tumbled in order to achieve the desired shell shape and resulting yield. Catalina Sea Ranch is testing experimental batches and varying tumble methods, in order to determine the most efficient methods for profitablity. Voracious grazers, these mollusks actively move and devour seaweed at an impressive rate along the West Coast. This species of abalone is the largest in the world and with additional research, there is an opportunity to co-cultivate these with Giant Kelp in the open ocean suspending in cages above the kelp to provide a constant rich diet for this iconic high value marine crop. We have partnered with Urchinomics to test “ranch bulking” techniques for fattening the roe of wild sea urchins using a specially formulated feed in a proprietary cage system created by Mitsubishi for an innovative sea urchin feed that sinks, possesses the correct shape, and can last in water for over a week without dissolving, as sea urchins are slow eaters. From an economic perspective, there are no marine aquaculture operations that can add such value in 10-12 weeks. From an environmental perspective, the offshore ranch-bulking concept takes an over-abundant resource that is hindering growth of other stocks and transforms it into a valuable and sustainable seafood product. This venture takes a natural resource that has very little economic value, a sea urchin with little or no marketable roe, turning it into one of the most lucrative seafood products on the planet.